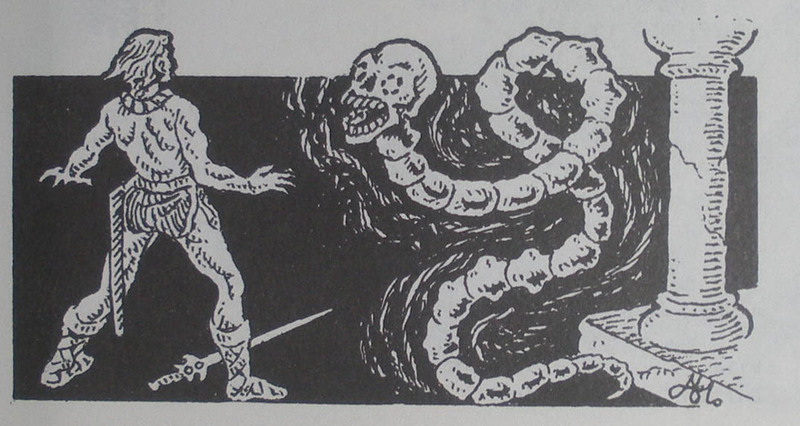 The Necrophidius is one of those bogus pseudo-undead creatures that were so common in the Fiend Folio. The illustration shows it as a huge fanged skull mounted on a ribless vertebral column, but the text seemed to imply that the construct was a regular skull atop the skeleton of a large constrictor snake. I always had the the impression that the Necrophidius moved about by means of levitation, rather than slithering along the ground because of these illustrations. Certainly no normal snake would be able to manage these postures, and levitation could also explain its ability to move about without making a sound. Shown below are a selection of Necrophidius miniatures. The first miniature is the Citadel Death Worm (Fiend Factory FF7-1), followed by the Nekrophidian (Black Tree Design M161), and the Death Worm from the Lich Mage and Death Worm set (RAFM 3735). 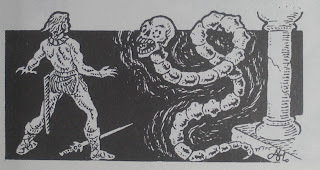 The Citadel miniature is identical to the Fiend Folio illustration, while the RAFM miniature is probably closer to the written description of the Necrophidius (in that the vertebrae are not grossly over-sized). The BTD miniature differs because it has a serpentine skull instead of a humanoid one. I use these miniatures as undead, since they are animated skeletal constructs, which in my game are created through necromancy. I do allow the possibility for magic users to animate skeletons without using necromancy, but why go through the trouble of digging up a bunch of old bones when you can animate material that is more easily obtainable?